What makes a family? A single mom? Two Dads? This book talks about all the different families. Families are ever changing in today's society. This shows that all families should be embraced and celebrated. Families are what makes them and the ultimate connecting factor is love. 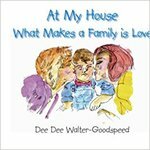 Walter, Dee Dee, "At My House What Makes a Family is Love" (2006). DIVerse Families. 47.